Check out weeks 1&2, 3&4, 5&6, 7&8, 9&10, 11&12, 13&14, 15&16, 17-19, and 20-22 here! 6 months and 10 blog posts later (well, 9 months and 21 blogs posts if we count the internship too), we’ve arrived at the last installment of my Summit Program series. 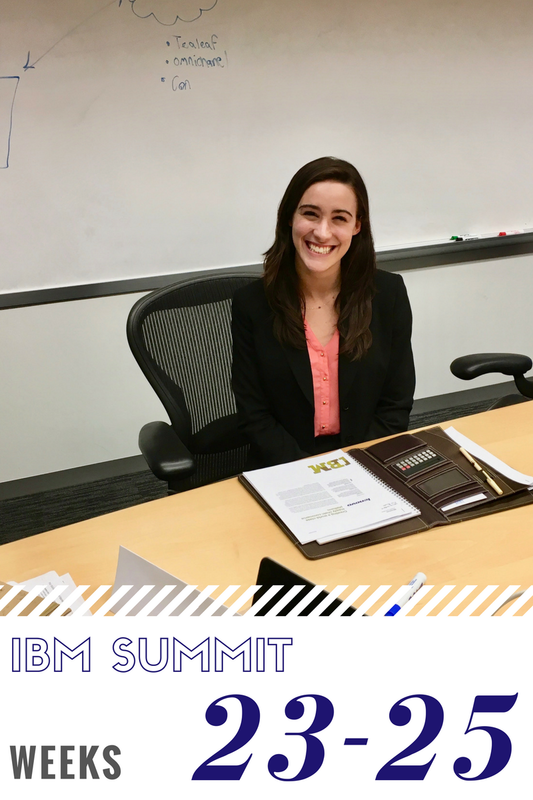 When I wrote my very first Summit blog post during my internship last year, I was hopeful that some people would read and enjoy my trials and tribulations and successes as I navigated IBM. What I didn’t expect was to have thousands of views and for dozens of phone calls and meetings to follow with people who connected to my writing and stories. It is only appropriate for this final post to begin with a thank you to everyone who has taken time to click on my post. Now, let’s jump into the last three weeks! Thanksgiving week was short, so I don’t have a ton to report. It was the usual combination of landing team work and getting ready for Global Sales School the following week. The final week of Global Sales School was all about bringing together every element of sales we had learned over the past 6 months and creating a distinctive experience for the client. The picture for this post is me right after my last role play. Don't let the smile fool you, I was crying on the inside. Thanks to Matt for taking this photo! I headed off to Chicago on Sunday to be ready bright and early on Monday. First, we had “agile” training where we learned about the best practices for teaming and continuous improvement in self organized groups. There are many elements of agile, but instead of going into all of that, I’m going to describe an exercise we did that I loved. In our group of 30 people we were each given a tennis ball and told that we had to maximize the number of tennis balls that every single person had touched. The catch was that you could not pass the tennis ball to the person directly to your left or right. Oh, and the ball must end where it started to earn a point. We were given less than a minute to organize and execute. As you would imagine, the first time was chaos as we tried to work together, but with each successive round we got better. This taught us to identify bottlenecks, have a clearly articulated goal at the start of a project, and the value of multiple iterations. In the afternoon, we began our role plays. At the end of this week had to give a final presentation with our team and write a proposal for an e-commerce solution for the client. To find out the client’s requirements and what they wanted in a solution, we listened closely during every role play and got together to determine what we had to make sure to ask in each conversation. After a full day of role plays, we went out for dinner then made camp in the hotel lobby to work on our proposal. Looking around at all the other teams I felt like I was on The Apprentice with all of us getting ready for the next day. What I love about the Summit Program is the perfect mix of competition and support for each other. The next morning we were back in the office, hard at work on the proposal in the morning, and then the afternoon and evening were spent on the presentation. I’m so grateful for the team I got to work with during the program. These guys are talented and fun and smart and I did not stop laughing as we worked together. When we gave our presentation the next day it was surreal to realize that we were done with the Summit Program. There was a final lunch where our instructor, Feridoon, passed out our graduation certificates and announced that my team won the presentation competition! I also found out that I graduated first in the class and was given a book on international business etiquette as a prize. If you’ve ever read my etiquette posts, you’ll know that etiquette is a passion of mine and I was so excited to receive this book! Leaving Chicago and saying goodbye to my friends was sad, but here’s to hoping we’ll reunite at the THINK conference in a few months (Vegas, anyone?). The Summit Program was a wonderful introduction to the professional world and now I am focused on putting to use the skills I built with my landing team. This past week I attended the IBM Payments Summit in Manhattan where IBMers and clients got together to discuss trends and progress in the payments industry. It was a great learning experience and gave me the chance to meet more of my team who live across the country. After that event, Logan and I went to a Fintech talk that IBM hosted about how startups work with large companies. These sort of events teach me more than I could ever hope to on my own and provide a great place to meet people in the industry. Being in Manhattan puts me right in the heart of the action of the Financial Services industry and I cannot wait to continue my career here. There you have it. My final Summit Program installment. 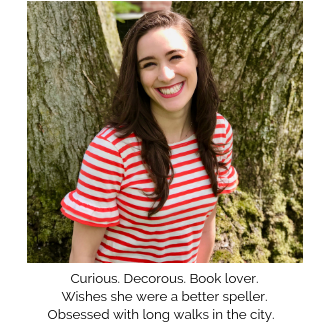 Blogging about my experience has been a wonderful way to capture and remember this time, and I would love to continue sharing my career story in the future.